This week’s Make It Monday challenge over on Nichole Heady’s blog was “From Black and White to Color“. This is a technique I see often and love, but hadn’t tried before. And the main challenge for me was finding a Papertrey Ink stamp set that had outline stamps I could use! Haha! For this card, I used the Vintage Linens set with some watercolor paint. 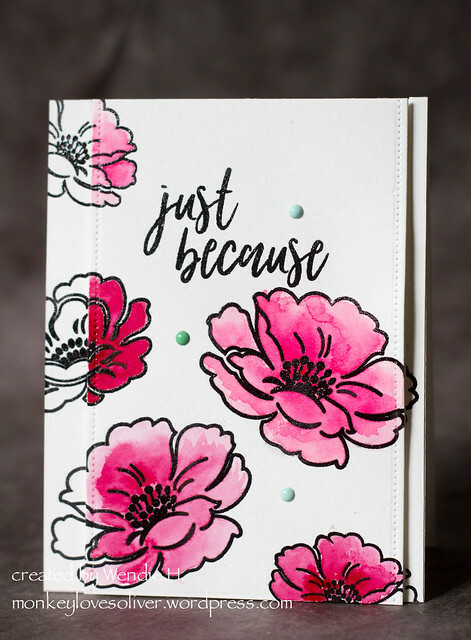 I stamped the flowers and sentiment onto a piece of watercolor paper with Versafine pigment ink and heat embossed them with clear powder. Then I cut out the vertical panel and painted the flowers. I adhered the side strips to my card base, and then used some craft foam to make the vertical panel pop out. Short and quick today. I got happy mail yesterday and more is coming today, and I want to play! Thanks for stopping by and see you next time! Gorgeous card, Wendy! Love the aqua blue dots with your bright pink blooms. Love the watercolor technique…so beautiful! This is beautiful, Wendie! Wonderful take on the challenge!